I love this phrase. It reads 君子の拳 Kunshi no Ken or the law of a virtuous man. 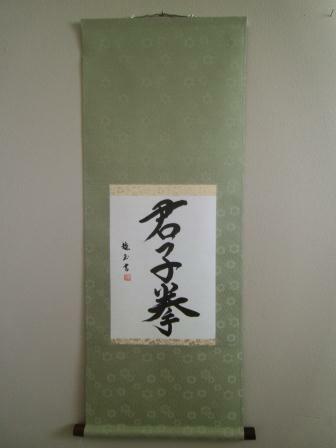 It is written by Yoshimi Yamada Maples (Ryugyoku) in the Semi-cursive (Gyousho) style. 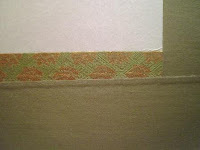 The scrolls is completed in a sea green kireji donsu with karakusa. The jikusaki is Shitan or Rosewood and the kakehimo is Kinka, light green with a gold pattern. 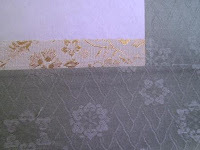 This scroll is completed in the Fukuro Hyougu style. 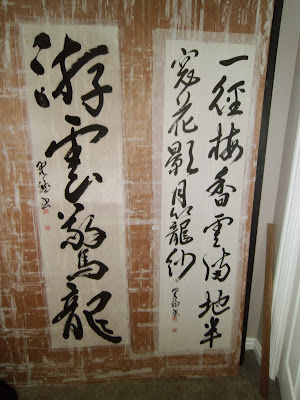 It was ordered by a Zen practitioner in Canada. 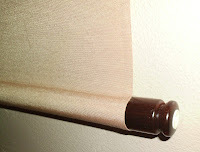 The fukuro hyougu style is an informal (Sou) style of scroll. It is characterized by the use of suji, thin strips of cloth that can go either horizontally or vertically onto the scroll. In this case the suji are placed horizontally. The customer wanted a black cloth (Kireji), which reminds me of the robes I saw the Buddhist priests in Japan wearing in their clergy work. The pattern I was trying to accomplish was light, dark, light. For that reason I used the white suji, the Ivory Plastic Jikusaki, and the takuboku kakehimo (White with blue and black speckle Hanging string). I think this scroll turned out quite nicely. This is a critique of a display at the Toko Kazari competition at the Clark Center for Japanese Art and Culture in 2011. 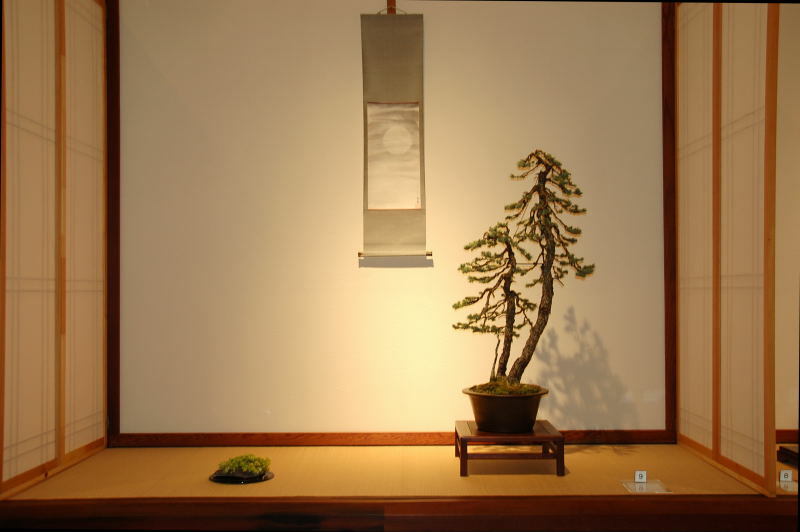 Picture was provided to me by Bob Hilvers, Bonsai Curator at the CCJAC. The revised picture and written critique is provided by Kuzuhara (Family Name) Hiroyuki (First Name) Ikkou is the name given to him by his display society upon reaching shihan rank. This is also a well constructed display. It is like a Bunjin Styled Ezo Matsu, (The owner of the tree told me it was not an Ezo Matsu, but I forget the actual tree), but the imagery of the branches on the thin trunk growing down by the natural weight of snow is very easy to see in the display of this tree. Within the three trunks, one trunk exhibits the stress of nature and resembles the bones after a buddhist funeral pyre. The accent and the scroll are very good and right on target, but there is one point that came to my attention. That was the use of the pot and table. A round, shallow pot works best for thin trunk trees that are considerably taller. The depth of the pot and the trunk thickness is an example to use as a comparison in display. The general rule I follow is a shallow pot for a thin trunk and a little deeper pot for a thick trunk, with deepest pots for Kengai etc. For this display, rather than using a mid height table (中卓) I think this display would harmonize better utilizing a Jiita. 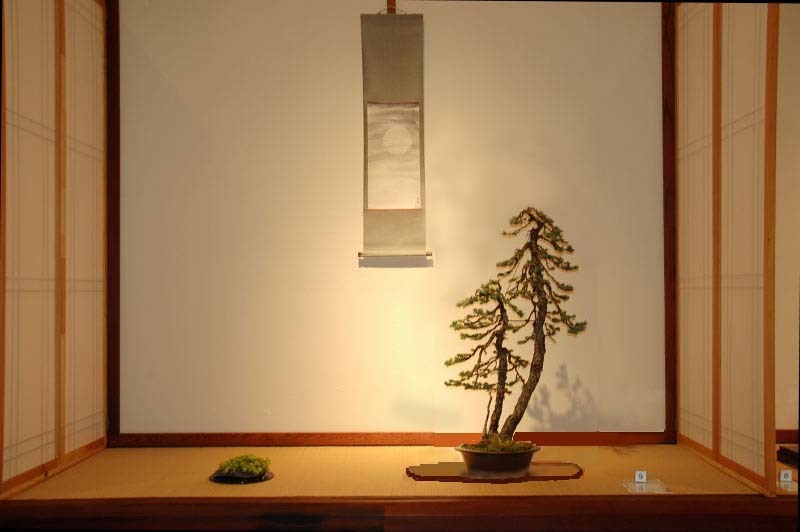 (See the attached picture) By using the Jiita, it changes the tree to look more alive, the entire display scene to become widened and improves slightly an already wonderful display. This particular set up also pairs better with the Shin (formal) classification of the tree type, with the Sou (informal) styling of the tree. These two scrolls are also ordered for Home decor. The one on the right reads I am my Brothers Keeper, I am my Sisters Keeper. In Japanese it reads "Watashi wa Kyoudai no banin de ari Shimai no Banin desu. 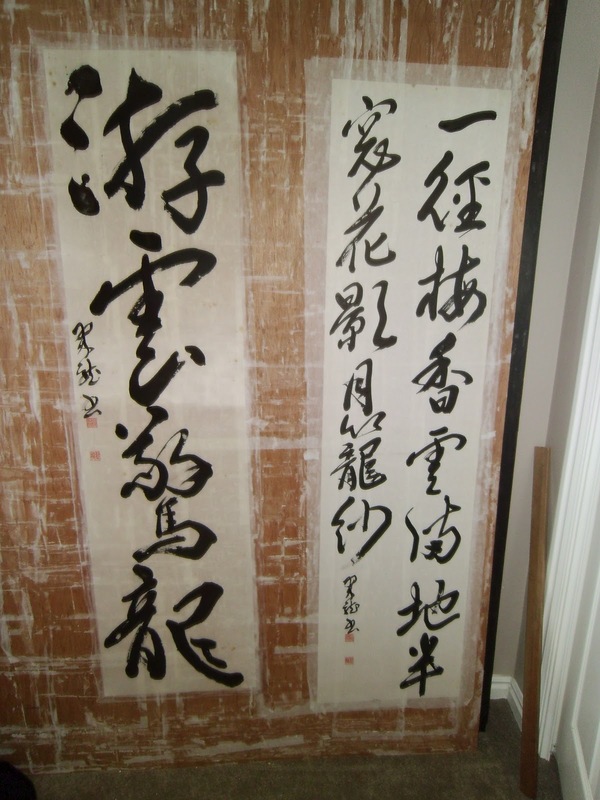 The scroll on the left reads Walk cheerfully over all the world, answering God in everyone. 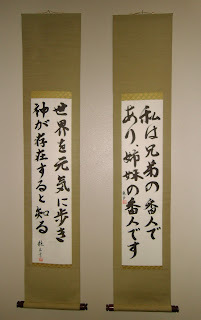 In Japanese it reads Sekai wo genki ni aruki kami ga Sonzai suru to shiru. Both of these were written by Yoshimi Yamada Maples, under the supervision of her own sensei while she was back in Japan. 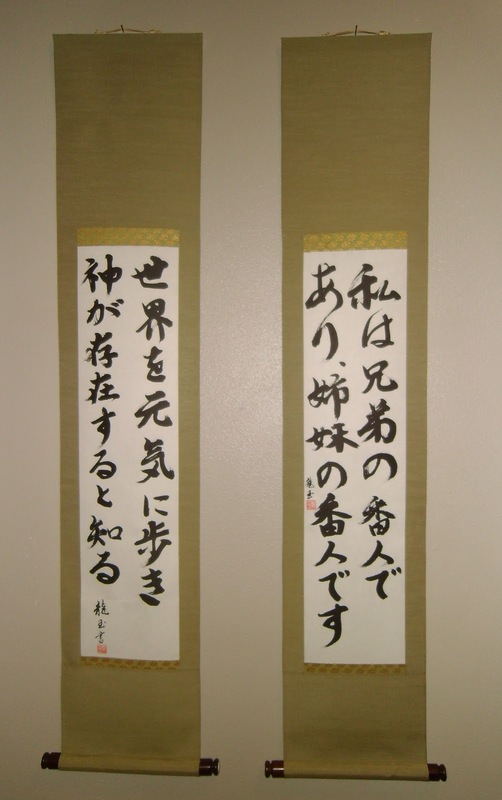 They are written in the Gyousho style. 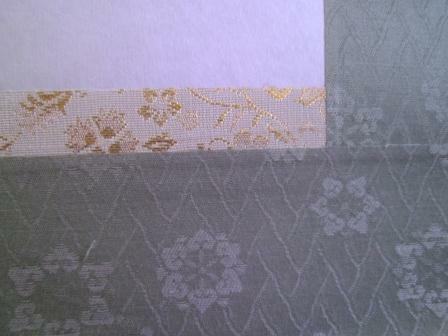 Both scrolls are completed with a Celery green silk, and the Ichimoji is a beautiful Gold on Green. The jikusaki are the rosewood with design and bone inserts. 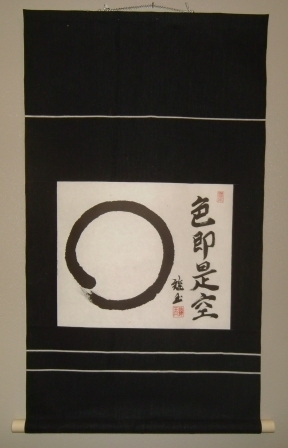 The Hanging string is the Usukincha. I put the Hada Urauchi on these two Joufuku works done by Yoshimi's younger brother Kouji Yamada....I think it is good to do some work on Labor day. The paper on the left had about a 1.5 inch tear on the side...can you see it now? This scroll is written for a phrase of Pascal. I know calligraphy purists will poo poo the punctuation...however as this is a western theme we thought it best to write as such for this particular case. The phrase reads in English. "Man is but a reed, the most feeble thing in nature, but he is a thinking reed...All our dignity consists then in thought." It witten in the Gyousho style. 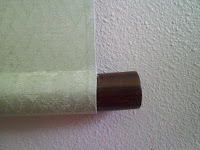 The scroll is done in a beautiful taupe partial silk. The Jikusaki is a beautifully carved rosewood with a bone insert.